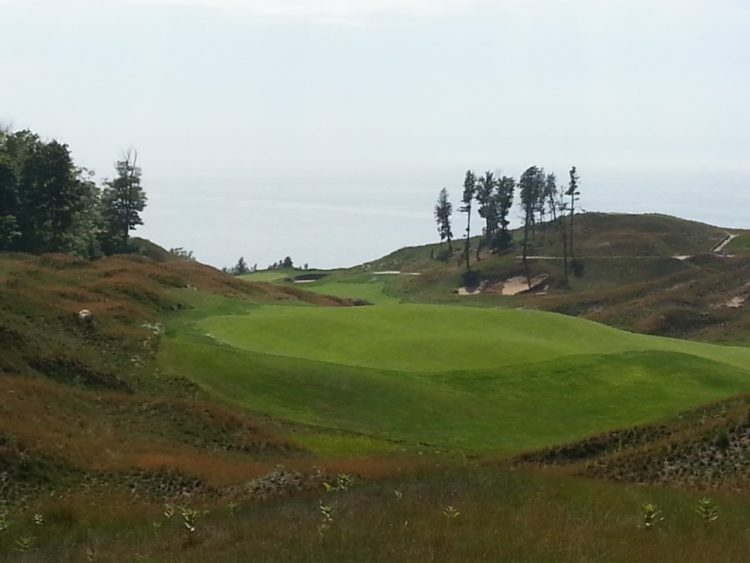 Arcadia Bluffs is consistently rated as one the nation's finest courses. Blondes or brunettes? Brats or burgers? Craps or blackjack? Some choices in life are tough. Really, it comes down to a matter of preference. The same goes for pitting Arcadia Bluffs and Whistling Straits against each other. Those who have had the opportunity to play each should consider themselves to have won the golfer’s lottery. Regarded by many as the top two public access courses in the Midwest, the shoreline layouts are separated by just 75 nautical miles across Lake Michigan, yet too far by automobile to make in the same day. Staff members at Midwest Golfing Magazine (MGM) have been fortunate to play both courses within the past couple of years and are excited to hear Arcadia Bluffs will be adding an inland second course, the South Course, by summer 2018. It will then join Whistling Straits, which also has the Irish Course, as a 36-hole destination. Sure, a course’s logo has little to do with how it stands up to another. But everyone likes to ease into a round, right? The logos here are too good not to mention. Arcadia’s seems to be inspired by the view from the tee of the par-3 No. 17 or from the Adirondacks behind No. 18. Whistling Straits’ looks like a wind-blown version of owner Herb Kohler. The mounding and rugged shaping that frames the fairways at each course is a testament to golf course creation and construction. At the Straits essentially 14 holes run parallel to the lake, a nod to traditional links course layouts. Holes 2-4 and 14-17 essentially play to the same wind direction and Holes 5-13 play to the opposite. Hole No. 5 sticks out like a sore thumb – a snake like par five with an inland pond – and No. 18 has been re-designed from the original to accommodate players of all levels. Both play to specific links themes but Arcadia (five par-5s and five par-3s) flows better hole-to-hole and finishes with better scoring opportunities for the average player. It also opens with three par-5s in the first five holes. Great one-shotters are always memorable. And who wouldn’t want to say they had an ace at either course? Fortunately, all nine par-3s are memorable. Only one of the five-par 3s at Arcadia is along the lake but they all play in different directions with little variation in yardage. At the Straits all four of the par-3s dramatically hug the lakeside. Holes 3 and 17 lay in the same direction and Holes 4 and 12 run in the opposite. There is greater variation in yardage from different tees, too. Even though No. 12 has a quirky green – with a devilish back right porch made really for pros only – the par-3s at the Straits are unequally breathtaking. A truly great course evokes the ability to memorize all of its holes. Both courses have that factor regardless of Lake Michigan, which is the first talking point for each. From conditions to individual shots and customer service to dining, no stone is left unturned. When golfers leave either course, a bucket list item has been crossed off. Hazards abound on both courses here – from a volcano bunker off the tee (No. 2 at the Straits) and a lagoon (No. 5 at the Straits) to severely uneven lies (No. 11 at Arcadia) and the left side of at least one green (No. 15 at Arcadia). The views off Holes 3, 5 and 11 at Arcadia can be spectacular headed back towards the lake. At least three of the five holes are reachable. Two of the four par-5s at the Straits allow for run-up, more links-type shots. Hole No. 11 with its enormous sand pit bunker and No. 5 with its non-Lake Michigan water hazard do not. Hole No. 5 can be a double bogey or worse hole depending on wind condition and, as previously mentioned, is much different from the other par-5s. Arcadia’s better scoring and risk-reward options – including a more relaxing opening hole – give it the slightest edge. Visuals tend to cover up the difficulty at each course. Both play to a rating of over 70 and a slope of over 130 from the MIDDLE tees. Massive, undulating green complexes at tournament speeds tend to only add to one’s score. The hazards off the fairway are perhaps most difficult. Uneven lies, mounding, and wispy grass make for unpredictable plays. The Straits bunkers are rugged – over 1,000 dot the landscape. Some – like the greenside bunker bisecting No. 6 and those to the left of No. 17 are basically unplayable. The same could be said of some of the sod-wall bunkers at Arcadia which emit a different feel. Golf is about bad lies and bad luck sometimes and those situations seem to present themselves more often at the Straits. The hero recovery is more achievable at Arcadia. Straits designer Pete Dye and his crew had to grade some of the lakeside terrain to prevent erosion so the drop-off pales in comparison to Arcadia which is much more cliff-like. The Straits has eight dramatic holes where the lake is basically the boundary on the right or left. Arcadia has just two with less shoreline property. Still, the lake views on both courses are evident from a number of different holes and spots. The meat of any course will always be the par-4s because there are generally more of them. The Straits has 10 par-4s and Arcadia has eight. All things being equal, however, the Straits has a grandness to its par-4s that Arcadia lacks. Holes 4, 8, 10 and 13 are the best and No. 6 is a quirky little hole which offers the ultimate test in wedge play. There is more variety to the par-4s at the Straits which is always a bonus. Perhaps the biggest drawback to both courses is that five hours is the norm to play them. The Straits is walking-only. The caddies have a tough job carrying doubles, not to mention scaling the lunar terrain off the fairway to look for wayward shots. Arcadia allows carts but cart path only days, thicker grass off some fairways, and an on-course food shack can present problems. The best approach is just to enjoy the views, soak it all in and realize not every round can be as quick as early Saturday mornings at the local muni. The humps, hollows and swales of the massive greens at the Straits are difficult to manage and almost always in tournament condition. There is little chipping area around most holes and some sharp drop-offs which require a Phil Mickelson-like short game. Like off the fairway it can be the luck of the draw in a greenside bunker. Arcadia has similar greens and challenges around the greens, but on the whole, up-and-down opportunities seem a bit tamer. The putter is more of an option off the green, too. The sod-faced bunkers can mean a one-stroke penalty but make for great photo opportunities nonetheless. Both courses are distant from any appreciable civilization. Both replicate the feel of being somewhere special, somewhere outside the Midwest, add in that Lake Michigan looks like an ocean. With transformative powers then it is no wonder that each course is jam-packed during the short golf season. The Straits has one of the best 19th holes and cozy dining. It also has caddies who will help immeasurably on the greens and when the winds whip up. Arcadia has spectacular views from the dining and lodging areas and behind No. 18. Arcadia is more golf-cart driven but the overall vibe makes a golfer never want to leave. Above all, the bunkering at each course leaves the most lasting impression. A sheep or two has been known to roam the grounds at the Straits, too, even as golfers line up putts. Both par-4 holes could not be more different. The Straits No. 18 is a monster playing to a risen fairway that runs out to the right and snakes around a collection of bunkers down to the left. The approach shot can be intimidating, playing over a cauldron of thick grasses and thin bunkers with a winding creek at the base. There is a bailout fairway area to the right which leads to the three leaf clover-shaped green. Par is probably a more likely score at Arcadia’s 18th which plays shorter on the scorecard but climbs uphill. Therefore, approach shots often play partially hidden. The Straits probably has the edge for drama finishing to an amphitheater setting with the Irish farmhouse-style clubhouse in the background. Arcadia also plays to a crowd with the Adirondack viewing area behind the green as well as the coastal estate-style clubhouse. Everybody likes to play a course the pros have played, right? Let alone a major championship? Augusta may be only a dream for most but at the public-resort Straits course, golfers can actually marvel first-hand at where Jason Day hit his drive on the par-5 11th during the final round of the 2015 PGA Championship. Or stand at the spot where Dustin Johnson infamously grounded his club in a “bunker” at the 2010 PGA. Television coverage only enhances the memories of hitting a great shot or having a great round.